About a week ago I was rummaging through my collection of baseball caps that both excites and horrifies me with the size that it has become. When I was about five years old I attended Sesame Street Live, and had my life changed by Ernie’s heartwarming rendition of “Rubber Ducky”. So much so that my parents bought me a six panel, yellow and white cap that barely fit my then blondish scraggly mop. I’ve treasured that hat for what it meant – wonderful moments with my family – but it also began a life-cycle of hat collecting that hasn’t slowed much in recent years. Through the hundreds upon hundreds of hats in my collection, this particular week I dug bravely into the dark brown trunk that contains fabric memories of my younger days. At the very bottom of the pile, through the Chuck-E-Cheese, Goofy, and used tire themed caps emerged a solid red, corduroy number with a long leather strap, and not much wear and tear. Stitched together with red thick thread that made the cap tighter than it actually should have been, it was an 80’s beauty. In a sea of red were three words, written in helvitca font, and in heavy black thread. It simply read USA BOBSLED TEAM. The hat, given to me by my uncle, came from the Lake Placid, New York Winter Olympics in the year of my birth (1980 for those curious). My uncle, whom was a native of the Lake Placid area, had several stowed away in his closet from the year of the Olympics as well as years upon years of visits to the US bobsled training facility. Nowadays, the Olympic Complex in Lake Placid gives tourists a halfway experience on the boblsed run with a brakeman and a driver. I’ve never done it, but it sounds fabulous. From that hat to Sochi, Russia in 2014 I’ve experienced a solid 33 years worth of Olympics. My earliest memory of the Olympics is about as vivid in my mind as the day it took place. 1988, Calgary Winter Olympic games, that wonderful Jamaican bobsled team. Long before Disney spun the moment into a cartoon like existence on the big screen, the genuine site of a warm weather team playing in snowy Calgary was mystifying. My love of bobsled, the winter Olympics, and the games in general suddenly had a stranglehold on my senses. I’ve loved it ever since. Then there was the summer games in South Korea followed by the two-headed-sensation of the Albertville/Lilehammer events with the Harding and Kerrigan saga. Sandwiched in between were the Barcelona, Spain games and “Magic”, “Michael”, and “Larry” were the headliners. The dazzling NBA infused US Team was Harlem Globetrotter-like in every possible way. David Robinson blocking shots like a monster, Magic dishing to Michael, it was like a dream come true. Hence, the “Dream Team” was born. All points in between then have been magical. As an American I’m instructed, almost spoon-fed, the Olympics in a way that is very much focused on the success of the Stars and Bars. From the intentional sob story coverage to the let’s-watch-this-country-host-the-games-through-our-Westernized-completest eyes. It’s the US all the way, whether you like it or not. Over the years I’ve digested enough of these international spectacles to know the difference between great story and great US story. A guy who is severely injured in a bus accident, resurrects his life both physically and emotionally, only to come in last place in the long jump – he’s a hero regardless of his nation of origin. The older I get, the less fluffy I want NBC/ABC to be, and the more I want true access to the athletes themselves. In the last two years, two Olympic games, I’ve done just that. The emergence of technology, and the “always on” mentality of sports has revolutionized the way I am entertained. The London games two years ago allowed me to see events I’d never seen before. Or perhaps I saw them, just not in their entirety. For a guy that has long loved the Olympics, and mostly viewed them through the US-colored glasses I had to wear while watching a TV, I’ve found new life and new promise in international competitions. This is a great thing. After two weeks of Winter Olympics in Sochi, I’m exhausted. In the states you could watch from 11:00pm on Tuesday night until 11:00am on Wednesday morning. Break for about 6-8 hours, then dive in to the primetime coverage at 7:00pm, only to start the cycle again in four hours. It is a pace that I (for obvious real life reasons like work, family, etc) couldn’t keep up with, but did my best to indulge in every square inch of viewing that I could. In the end, it was worth it. French, Canadian, Ukrainian, Russian, German, Swiss, and on and on – my love of the world, as seen through seemingly endless hours of sports has continued my passionate pursuit of the Olympics. The Russian games in 2014 were met with much accusation in terms of what they meant. In the end, we all learned quite a bit about celebrating the differences that make us so vastly interesting. Through the distraction of sports, we might have forgotten about the struggles for equality in various corners of the world. In some instances, we forgot about it entirely. The Olympic games always have an impact, and sometimes they are good, sometimes they are bad. For all the reasons one could have hated the Sochi Olympics, I think we found reasons to love them even more. Perhaps many of us even had our eyes opened to the harsh realities that the world presents. In short, we forget what life in the other 90% of the world is like. It’s very different. So I bid adieu to the Winter games of Sochi, I fondly look forward to Rio in 2016 as well as Pyeongchang in 2018. I don’t want to sound grandiose about how sports unites the world, but sometimes it does. As we celebrate diversity in life, country, and personage, let that not only be for the two weeks of Olympic competition every two years. Let it be a lifestyle. Being an Olympic athlete seems like a thrilling endeavor. For some, those whom compete in less instantly recognizable sports, they will find joy at each and every turn. The skiing community, although greatly diverse in its interests, is a tight knit group. The familiarity that alpine, downhill, cross-country, and biathlon participants have with one another is ever present. Where the snow, and the events go, so they go too. After some strange, and surprisingly wintry weather (finally) in the mountains nearly an hour from Sochi, the 15KM biathlon mass start finally began despite some delay. With a great finish, and a deep breathe, we get this photo. 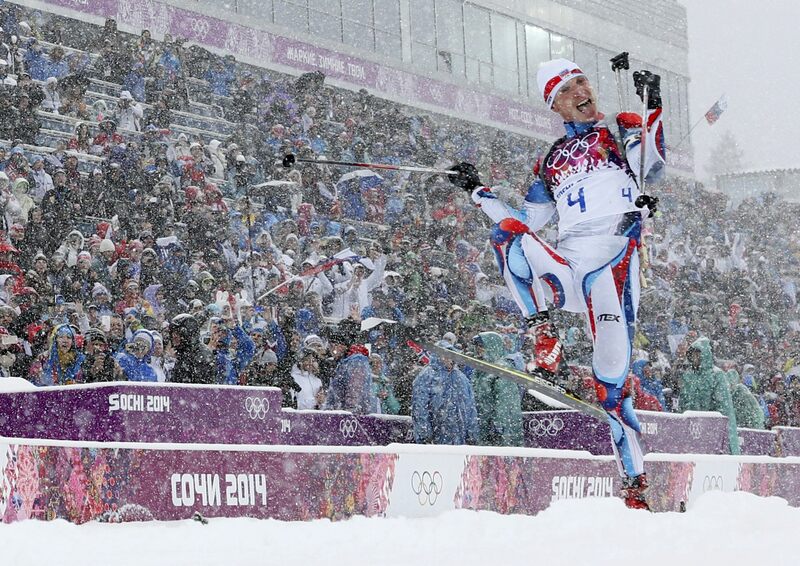 The Czech Republic’s Ondrej Moravec celebrates in the only way he knows how – posing for the camera. Perhaps exhaustion had set in, or maybe he was just soaking up the postcard moment in his sport, but either way this is a great photo. Thanks Ondrej! As we’ve moved on to the two-man/woman bobsled events, and eventually to the four-man/woman variety, I can’t help but wonder, “What is the fastest thing at the Winter Olympics?” Apparently I’m not alone because the folks at Smarter Every Day (great YouTube page, you should check it out) were wondering the same thing. In this graphic there are things I knew, and things I didn’t. The luge is clearly a more aerodynamic sport when compared to skelton, but not by much. Perhaps proving my hypotheses right…NO HUMAN BEING SHOULD GO FACE FIRST ON A SLED EVER!! Also interesting? The ski jump ramp takes participants upwards of 60 mph, but it’s nowhere near the velocity of a Zdeno Charra slap shot. 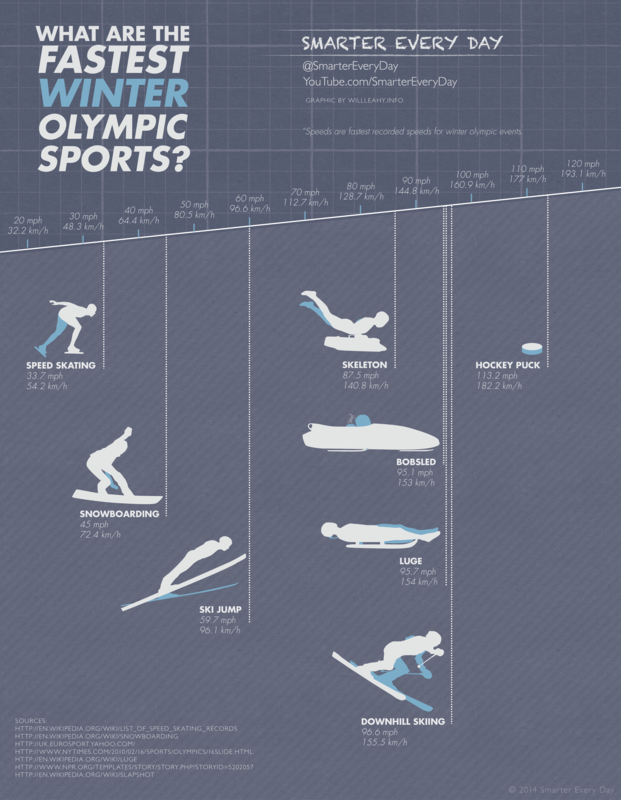 The hockey puck…still the fastest thing at the Winter Olympics. In the very first event of the Sochi Olympic games, I nestled into my easy chair, put a steaming cup of Five O’Clock Coffee to my lips, and dialed up the NBC Sports Live Extra app. The snowboarding slopestyle event caught my eye, as I had recently witnessed it’s transformation from goofy fringe, snow sport to legit medal sport at the Winter X-Games a few weeks ago. As those ladies and men tore down the slope, Shaun White excluded, I sorta held my breathe at the Hot, Cool, and Yours section of the slope. The man guiding us through this adventure was a gentleman, a Brit in fact, named Jack Nicholls. Jack was consistent, simple, informative, and exciting – a rare four-headed beast in the analysis business. His accent rolled beautifully over mentions of 360’s, 720’s, and 1080’s. I felt like I had heard him before, but upon further revelation, I hadn’t. His familiarity was present because he wasn’t overzealous. He let the uniqueness of the sport dictate what was said. In short, the sport is what it was meant to be, the showpiece, he was just the tour guide. It has been a joy discovering Jack Nicholls. A motorsport commentator by nature, he has the legit skills in various extreme sports including slopestyle and half-pipe events. He’s a jewel in the otherwise dull Olympic Broadcast Services quiver of arrows. The first motorsport I ever saw was qualifying for the 1997 British Grand Prix. That short glimpse of the greatest sport in the world got a little 7 year old hooked on F1, and from then on-wards I hardly ever missed an F1 race, including saving the money to follow the circus to Monza, Spa, Melbourne and Valencia. As soon as I turned 18 I began marshalling on the banks of the UK’s circuits, and soon decided I’d like to become involved in circuit public address commentary. After getting in contact with a number of working commentators in the summer of 2009 a couple were kind enough to help me out, and towards the end of the year opportunities started to crop up which allowed me to pick up the mic myself. A self-made fella, who has caught the eye of the Olympic broadcast decision makers. I approve, and will continue to do so. Keep your eyes peeled for Jack Nicholls, he’s a keeper. It was the right thing to do, putting a T.J. Oshie photo on today’s “favorite” post. In reality the US hockey team should have lost the game, had every chance not to, but in the end somehow magically finished the Russian team off on their home ice. By finished off, of course, I mean that T.J. Oshie went 4 for 6 in the shootout, smiling and dominating his way through the whole thing. Lester Holt Dances With Kate Hansen, Best Thing Ever! You wanna see something cool? Lester Holt has moves, something we all assumed to be true. He’s just long needed a dance partner. Enter Kate Hansen and her Beyoncé inspired dance spasms. She’s given the luge community reason to celebrate. Go Lester Go! Knee deep into women’s hockey already, the men take to the ice beginning Wednesday morning with a double-shot of games. By the time the Czechs take on the Swedes, and the Latvians take on the Swiss, the Olympic hockey from Sochi will officially be in full swing. Lost seemingly in the hoopla of the NHL ending, the opening ceremonies beginning, and medals already being handed out is the fact that one of our own home-cooked Oklahoma City Barons (current Oiler) is making his Olympic debut. Set your alarm clock for 6:30am (CT) on Thursday morning as Martin Marincin laces his skates to square off against the United States in what promises to be a pretty entertaining game. Despite the Chara-ing of the whole situation, the fact that young Marincin is playing in this game is quite the extraordinary feat. Making a headlong surge in the NHL this season with the Oilers, Marincin has shown promise. Enough to catch the eye of the Slovakian national team. When his name landed on the roster I was impressed. Not many 21 year olds have the opportunity to represent their country in this capacity, and for Martin he will bask in the glow of how incredible these winter games will be on the grand scheme of his career. Join me for the #MartyParty at 6:30am on Thursday morning (NBC Sports / Live Extra – stateside). There is big business in the Olympics well beyond what the host city lays down in terms of cold hard cash. The athletes, all fitted with the proper country-specific attire, are walking billboards for Ralph Lauren cardigans and Burton snow jackets. Yet there is even more uniqueness when it comes to helmet design. Skis, boards, skates are all necessary weapons in the holster of Olympic athletes. Equally as important? The helmet. Protecting you from cold, hard ice and snow is really a strong lid (hopefully). Forget black, red, white, or brown, how about the helmets designs that the Guardian highlighted in a recent piece? My favorite has and always will be the red-hot-brain. As if we didn’t know it was intense already, the glowing insides of the skeleton participant are on full display here (in a graphics sorta way). I love that. Read the full story, and see the other great pics over on the Guardian’s website. Deadspin uncovered a unique photo of the female goaltender for the Swiss hockey team being transported like my grocer transports oranges from storage to shelf. So unusual were the photos, that even multiple angles couldn’t explain away the bizarreness. But an answer was given. In Sochi, the Swiss women practice in Shayba Arena. The problem: the locker rooms are not in the same facility. For the players, this is no big deal. With their skate-guards on, they can manage without locker rooms. For the goalies, though, the trek is more difficult, since they have more gear to carry. 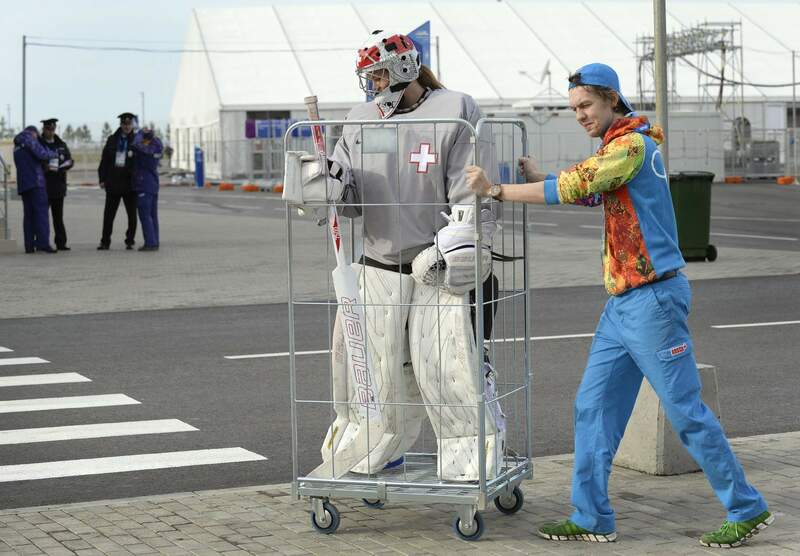 But the Russian hosts have found a solution: transportation in a cart. Florence Schelling looks appreciative.